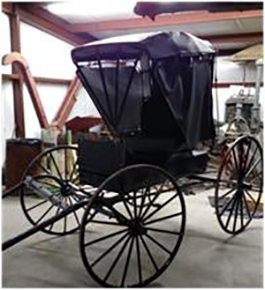 The Garder Buggy, as it has become known, was given to the Museum by the Herman Garder Family in the 1980’s. Although in disrepair it has always been considered a prized artifact. In 2014, the Historical Society board chose the buggy as it’s project for the first Big Give promotion. With the money raised from Big Give, the Museum board began to search for persons or companies who restore buggies. Logistics was a problem as was the cost of restoration. Also, it has been the policy of the Museum to use local businesses and artisans as often as possible. When the names of two Boone County residents were given to the board, they immediately made contact with both, and both agreed to take on the restoration project.